Below, I will briefly discuss four diseases that I have observed on tomatoes recently. 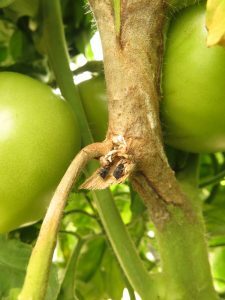 White mold of tomato – Perhaps the most common symptom of white mold of tomato is the light brown area on the lower stem (Figure 1). This brown area is essentially dead and will result in the wilt and death of the tomato plant above that point. Either on the outside of this dead area or inside the stem, dark, irregularly shaped fungal bodies can usually be found. These fungal bodies (known as sclerotia) are diagnostic of white mold. Figure 1. White mold of tomato, AKA, timber rot. Note the dark fungal structures where the stem has been torn away. The fungal spores responsible for white mold are released early in the spring from a very small mushroom (several mushrooms could fit on a dime). The spores will enter a plant where tissue is dead or senescent, such as old flower petals. Fortunately, white mold, once established, will not spread from tomato to tomato plant. However, growers may observe more symptoms as later infections develop. White mold is one of the diseases that I observe more in greenhouses than in the field. The reason for this is that greenhouses tend to increase the relative humidity necessary for disease establishment. Although the disease doesn’t spread from plant to plant in the greenhouse, growers may want to remove infected plants. The critical factor in removing infected plants from the greenhouse is not to let the dark fungal structures drop to the ground either inside the greenhouse or outside. The spores from the mushroom that may grow from the sclerotia in the spring may drift 300 feet or more. Take the infected plant well away from any tomato production and destroy if possible. Anything that can be done to minimize relative humidity and leaf moisture will help reduce the severity of white mold. Therefore, vent the greenhouse in the evening and space the tomato plants far enough apart to allow air circulation. More information can be found on this disease at https://vegcropshotline.org/wp-content/uploads/2016/02/VCH583.pdf. 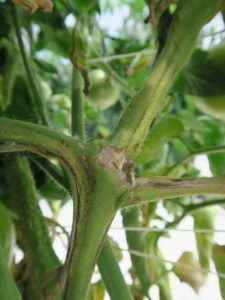 Tomato pith necrosis – We have observed this relatively unimportant disease in our own high tunnel. Often the first symptom observed is a chlorosis (yellowing) of young leaves. It might be possible to observe stems that appear shriveled. This may be associated with a dark brown necrosis of the lower stem and rotten pith (Figure 2). Low night temperatures, high nitrogen levels and high humidity favor the bacterium that causes pith necrosis. Therefore, it is usually seen in a greenhouse situation. The only management recommendation is to avoid high nitrogen levels in tomato plants as well as high humidity. Figure 2. Tomato pith necrosis. Note twisted stem and discoloration. Although tomato pith necrosis is not important, it is useful to be able to recognize the disease. 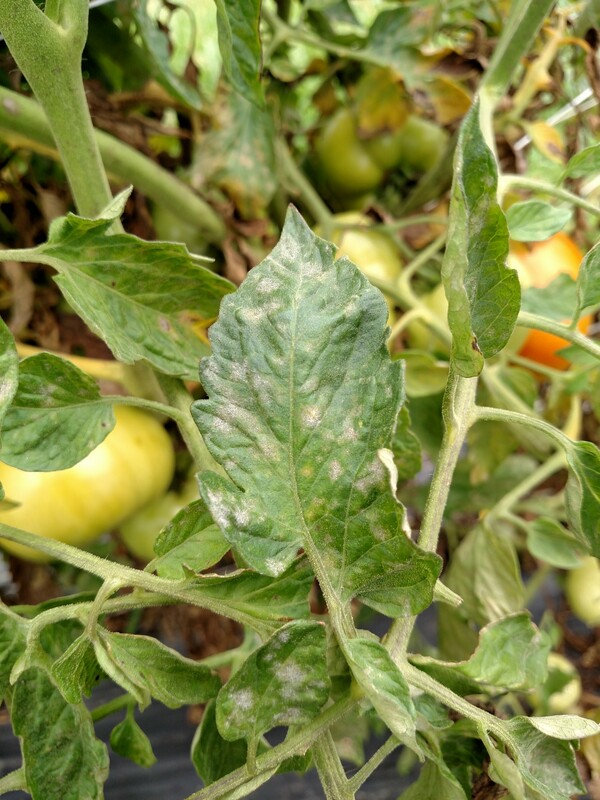 Powdery mildew of tomato – This disease was observed in a greenhouse in southwestern Indiana. Powdery mildew of tomato has not been an economic problem in Indiana. However, last year there were more reports of this disease than usual. Powdery mildew is more often observed in a greenhouse situation, but last year it was also observed in the field. The key symptoms of this disease are the talc-like lesions on the upper and lower leaf surfaces (Figure 3). It is important to note that the location of the upper and lower lesions do not correspond with each other. When the lesions are young, it may almost seem as if the lesions can be ‘wiped off’. Figure 3. Powdery mildew of tomato. Few varieties exist with good levels of host resistance, although growers may notice some difference in susceptibility between varieties. 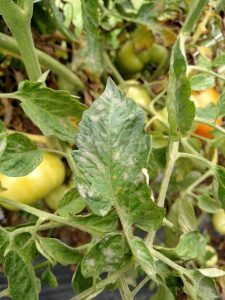 It may not be necessary to treat tomatoes affected with powdery mildew with fungicides. If fungicide treatment appears to be warranted, a few alternatives are: Fontelis®, Inspire Super®, Quadris Top®, several formulations of sulfur, Switch® and Vivando®. The products listed are all either labeled for the greenhouse or silent about greenhouse use. Check the label carefully before using any of these products. Early blight of tomato – While much of Indiana has been dry, enough leaf moisture has been present for early blight of tomato to get started in a field in southwest Indiana. Early blight can be recognized by the dark brown to black lesions often with bulls-eye-like rings (Figure 4). 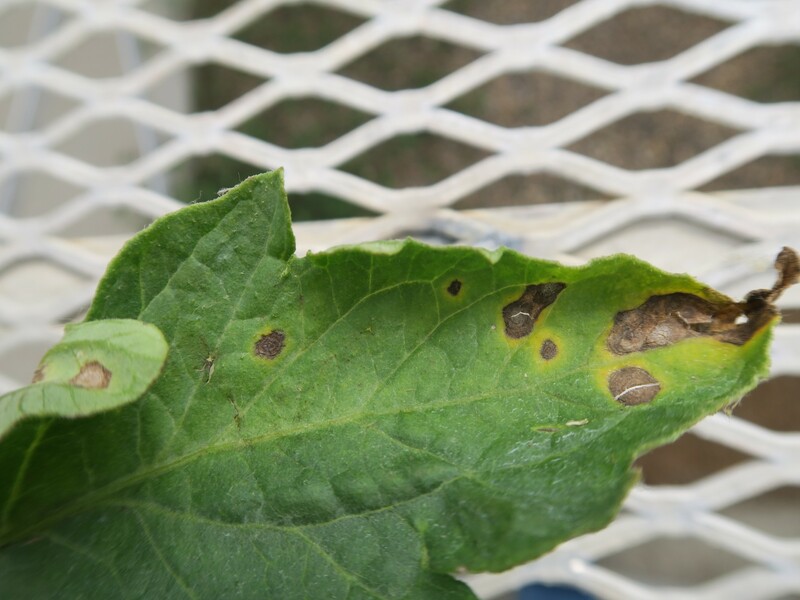 Normally, this disease is found in the field, not in a greenhouse situation. The key to managing this disease is crop rotation. A crop rotation of 3 to 4 years will help to lessen the severity of early blight. A few varieties have partial resistance to early blight. A contact fungicide such as chlorothalonil will help lessen the severity of early blight in the field. Systemic products rated as very good in the Midwest Vegetable Production Guide include: Aprovia Top®, Cabrio®, Endura®, Fontelis®, Inspire Super®, Priaxor®, Quadris®, Quadris Top®, Reason® and Switch®. Note that some strains of the fungus that cause early blight may be resistant to fungicides in FRAC (MOA) group 11. That would include Cabrio®, Quadris® and Reason®.